The safety and protection of your property is always a top priority. Let the experienced crews at EverLine strategically install Parking Blocks and Speedbumps to ensure everyone is safe and everything is protected. EverLine has Decades of experience in the Edmonton area. Parking lot protection is an important element of any parking lot maintenance plan. One often overlooked aspect of this is parking blocks and speed bumps. Parking blocks and speed bumps play a big role in protecting your property and those who use your parking lots. A great way to protect the curbs in your parking lot and control the layout of it is parking blocks. Regardless of the intricate layout of your parking lot, we can install parking blocks accordingly to suit your needs. Another big concern of property managers is regulating the speed of vehicles within parking lots. 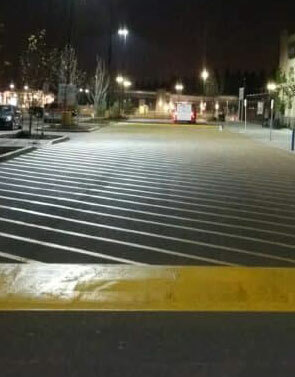 Speed bumps are a great tool to reduce the speed of vehicles and ensure the safety of your tenants, staff or customers. Our experienced speed bump installation crew can help determine speed bump placement and dimensions for effective speed control. When you choose EverLine for your parking block and speed bump installation services you get the EverLine advantage. We only use high quality materials and products in the installation process to ensure you get a quality and long lasting parking lot solution. We use high quality, reflective, Canadian made parking blocks in our applications. These blocks are durable, effective and noticeable. They do a great job of protecting your property and users. Parking block and speed bump implementation and installation is a strategic process that requires some planning on our end. We ensure we have considered all the potential elements to execute a working and long lasting solution for your property. When you choose EverLine, you get the EverLine advantage. We use nothing but the highest quality materials and our highly trained crews to get the job done. We’ve got decades of experience in the parking block and speed bump installation business. We’ve worked with some difficult projects and we’re ready to handle anything you can throw at us.